This is a Sponsored post written by me on behalf of zeebox for SocialSpark. All opinions are 100% mine. zeebox asked us to check out their zeebox tv companion app, which they describe as an “augmented television” experience. Essentially this is an app that you can use on your tablet, PC or smartphone that makes your TV viewing experience interactive, social and more informational. Instead of just staring blankly at the television, like a zombie, you can chat with other users about the show you’re watching in a zeebox TV room, read and reply to the Twitter buzz surrounding the show and get quick access to extended information about terms, names, concepts and other things that are mentioned on the show that you’re watching. There are also many other interactive activities that you can engage in, directly related to the content that you are viewing on your TV. I booted up an ol’ iPad (generation 1), navigated to the Apple AppStore and attempted to install the zeebox app. Unfortunately for me (and other older gen iPad users) I was disappointed to find that it would not install because it requires iOS 5.0 (or newer). But I was undeterred! 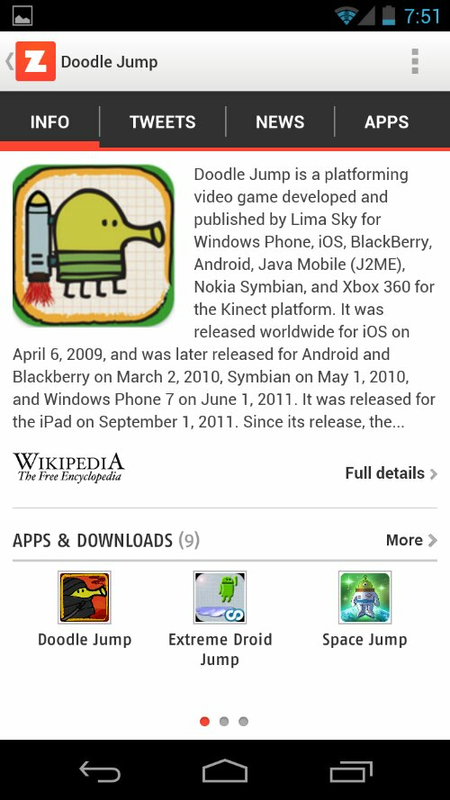 I opened up the Google Play store from my Galaxy Nexus smartphone and found the zeebox app available for install there. A quick download and install and I was up and running with zeebox on my Android phone. Note: you can also access zeebox via a browser on just about any computer. Above you can view a collection of screenshots from the zeebox app running on my Samsung Galaxy Nexus Android smartphone. Top row left to right; The zeebox home screen and an “identify tv show failed” alert, The Big Bang Theory show page in zeebox, Doodle Jump information lookup screen. Bottom row left to right; a zeebox TV room for The Big Bang Theory, a Twitter stream all about The Big Bang Theory and lastly, a Twitter stream all about “Warm Kitty”. After installing the app, I input my zipcode, selected my TV service provider and connected my Twitter and Facebook accounts to the zeebox app. All of this allows for a more customized and more social experience within the app. I then tried using the “identify TV show” feature, where zeebox uses your phone or tablet’s microphone to listen to your TV’s audio output in an attempt to identify what you are watching. Unfortunately, I tried this 3 times and it would not work with my Samsung Galaxy Nexus smartphone. 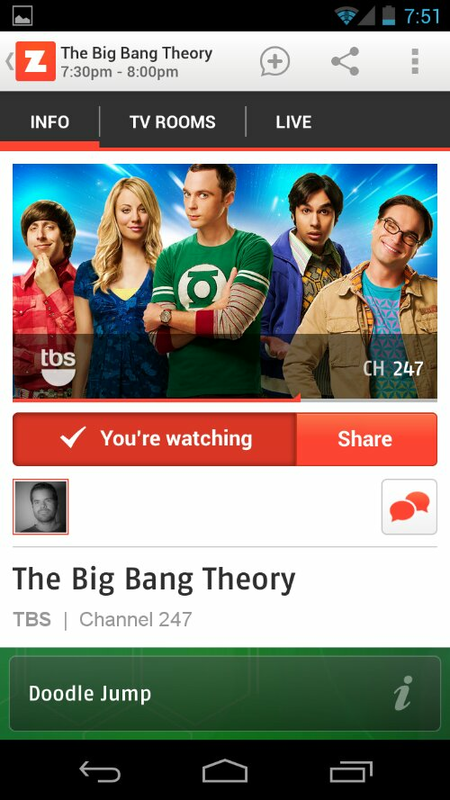 I looked at the popular shows on the TV Picks Now home screen of the zeebox app and decided to check out The Big Bang theory. The zeebox app even tells you what channel the show is playing on, based on the zipcode and provider information that you input when you first launch the app. With that handy knowledge, I quickly tuned to channel 247 and started watching The Big Bang Theory. As I began watching the show and glancing at my smartphone, I was delighted to see that zeebox automatically posts green information bar alerts to your screen based on what is occurring in the TV program you are viewing, as shown here with the green Doodle Jump info bar. Clicking on the green info bar takes you to an info display screen where you can learn more about the term via Wikipedia and other sources. Very cool! You can also swipe the info bar left and right to access other terms that zeebox is popping information alerts for. From there I searched out a zeebox TV room and found one for The Big Bang theory. The TV Rooms remind me of a Facebook page wall, where everyone can comment, Like posts, interact with others, share videos, photos, links and other content related to the theme of the TV room. These rooms can be public or private, so if you want to get crazy and have some inappropriate or heated discussions with friends while watching the same TV program, have at it! The zeebox app also lets you access Twitter streams related to the TV show you are watching and also the information alert terms that you are seeking out more information on. Another cool feature is the “Twitter replay”. If you are watching a program saved on your DVR after it originally aired, zeebox can show you the tweets that were being broadcast during the live airing. This is a pretty cool feature as it allows you to see and read what everyone was tweeting about while the show aired. You can also tweet and post to Google+ from right inside of zeebox, and its even an enjoyable experience! Below is one of my tweets originating from the Zeebox app. Notice the link to the show on zeebox, this automatic TV show link inclusion is an option when you are posting/tweeting through zeebox. I enjoyed testing out the zeebox app and I could definitely see myself using this app along with friends or family who are in other locations, enabling a more social and interactive TV viewing experience. We hope you enjoyed our quick write-up about our experience with the zeebox app and we encourage you to give it a try! Check out the zeebox video below to learn more.